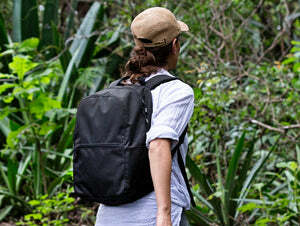 A lightweight travel backpack that converts to a tote and made from eco-friendly materials. Features stash pockets, a sleeve for your suitcase handle, and a removable insert with a dedicated compartment/pocket for a 13" laptop. Converts from Backpack to Tote Removable insert Minimalist Design Adapts to any situation and destination.